It’s no secret that Jennifer Lawrence is absolutely obsessed with the Kardashian clan. So, when the opportunity came for the actress to run a talk show, she jumped at the chance to sit Kim Kardashian down on the sofa. That said sofa happens to belong to the master talk host himself, Jimmy Kimmel. The funny man gave Jennifer Lawrence full keys to his studio and crew for one night. Image shared by @jimmykimmellive with the caption Guest Host Jennifer Lawrence is obsessed with @KimKardashian and has a LOT of amazing questions for her TONIGHT on #Kimmel! The ShoeDazzle founder was spotted arriving at the “Jimmy Kimmel Live!” show to sit down with some pretty hilarious questions from J.Law herself. Kim Kardashian arrives at “Jimmy Kimmel Live!” in Hollywood on November 2, 2017. Kim shows off her toned figure in a two-piece crop top and skirt outfit. The social media queen added her usual muted touch with a pair of Merah Vodianova “Ophelia” sandals. Kim’s outfits started becoming more and more minimal at about the time she started dating now-husband Kanye West. Years later, not much has changed. Kim showed that simple is better in a matching two-piece crop top and pencil skirt look. The mother-of-two also decided to ditch her bra for the day. A pair of Merah Vodianova “Ophelia” lace-up sandals completed her look. 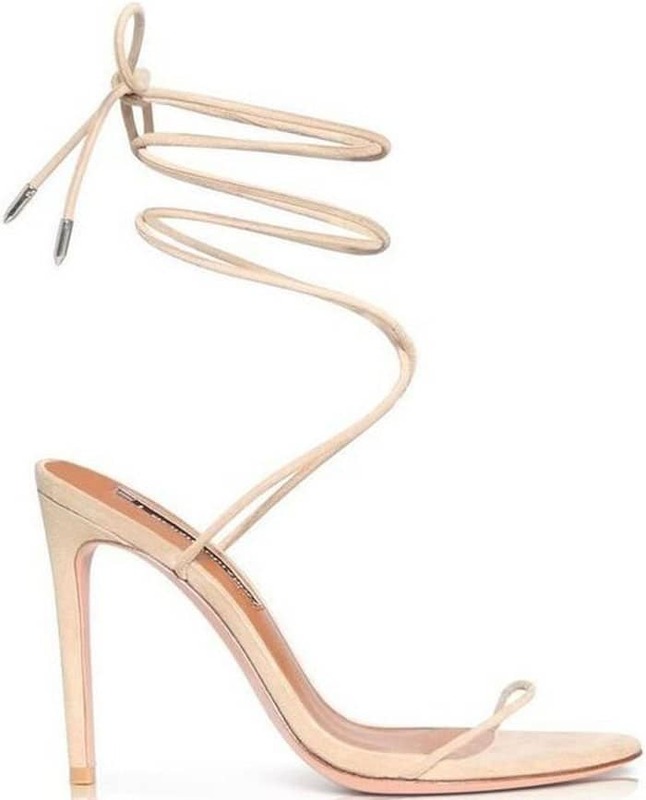 Is it just us, or do these heels look an awful lot like something that would come out of Kanye’s shoe line? Kim appears to go braless with only a gold necklace and a few rings accessorizing her look. Kim gives the cameras a little wave before disappearing into her interview with Jennifer Lawrence. J. Law said she recently joined the Kardashian clan for dinner, to which Kim retorted that she had never seen her mother, Kris Jenner, that intoxicated. Kim recalled the first time she met J.Law as well. Kim said Jennifer fangirled out, screaming just as her elevator doors were closing. The second eldest Kardashian is currently busy promoting her product KKW Beauty. Kim is currently getting ready to launch her super contour kit. 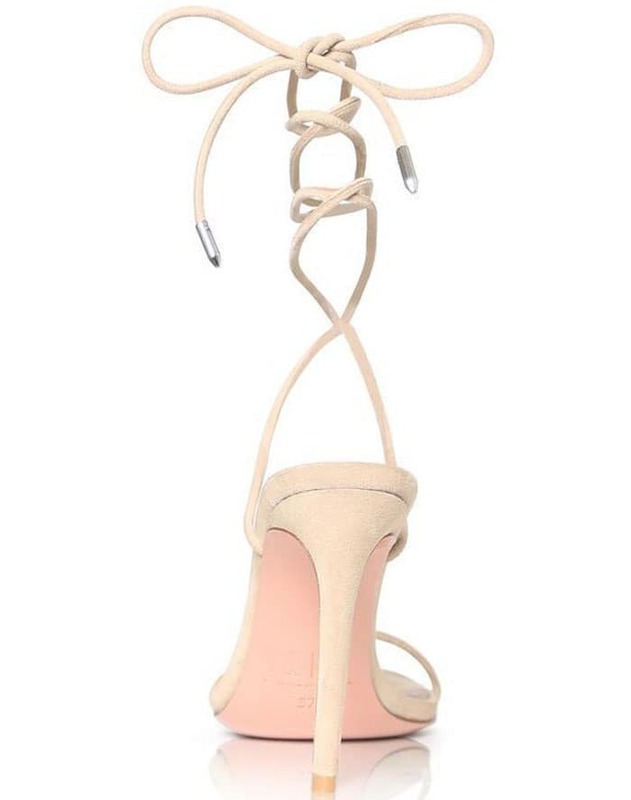 Shop Kim’s lace-up “Ophelia” sandals at Merah Vodianova.